Type O Negative – The Origin of the Feces, reissue album cover from Wikipedia. First I thought this was again going to be a difficult choice, since I have more than one favourite artist. However, when I looked back in my post on Day 1, my task became a lot easier, and I instantly knew which album I would name here. 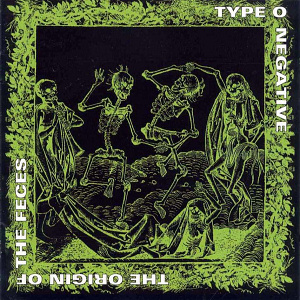 I would say my least favourite album from Type O Negative is called The Origin of the Feces (1992). According to some sources, it was recorded as a joke. And for me, it’s just not that kind of music I enjoy listening, and I have never listened to it completely through. And to be honest, it is also the original cover picture that makes this album pretty repulsive. In this post I used the cover of the reissue. PS. Tomorrow I will also add a new book review, so that this blog won’t be all about music for the whole month!